Some years ago, we took delivery of a small number of pseudoscopes, designed and made by Terry Pope, who is probably the UK expert on devices of this kind. It was made to a very high quality, it was supplied in a metal flight case, and it cost USD750! After they sold out, we sold a cardboard construction kit to make a pseudoscope, but it was time consuming to make, and the lack of glass front silvered mirrors reduced the quality of the image. It was very cheap though. Now, however, we think we have the best of both worlds. Designed by Terry Pope, this pseudoscope kit is made from precision laser-cut pieces of acrylic plastic, and it is supplied with 4 glass mirrors. 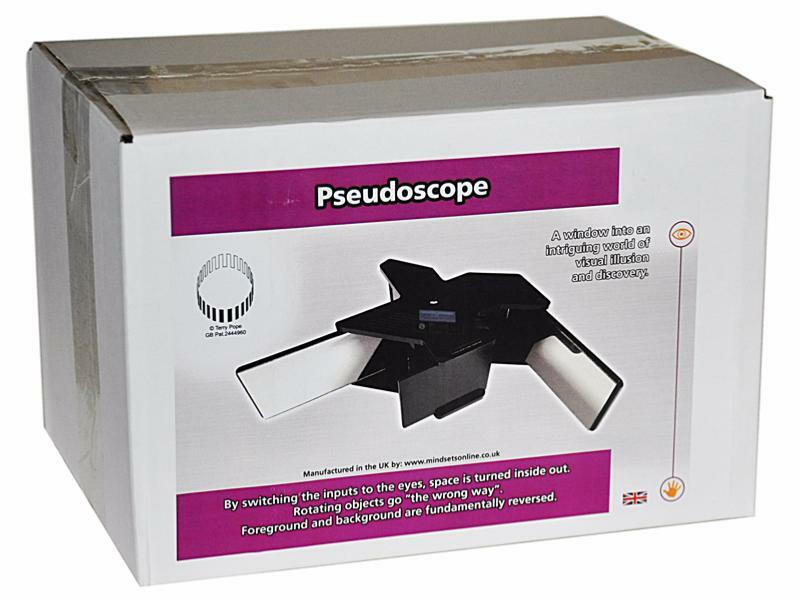 Although you do need to put the pseudoscope together yourself, it is a much easier construction task than the cardboard kit, and delivers a high quality pseudoscopic image. The Pseudoscope creates one of the most remarkable of all optical illusions, and was first described by Sir Charles Wheatstone in the 1830s. The Pseudoscope swaps the incoming images, so that the right eye sees what the left eye would have seen, and vice versa. The pseudoscope therefore does to front and back what a mirror does to left and right. This means that foreground becomes background and visible background becomes foreground, or more simply, background advances, foreground recedes. When you view objects with this scope, the convex becomes concave. A tree turns inside out as it were - it's front branches appear at the back, whilst the back branches come out in front, hanging or suspended in mid-air as their support is eclipsed by branches in front. The scope will suggest to the viewer that a person's face is hollow or concave but your brain refuses to accept such nonsence and so peoples' heads merely appear odd or uncomfortable to look at. It is best then to choose to look at a landscape or tree or anything which may suggest ambiguous perspective. In a real sense pseudoscopic vision fights `normal vision'. It is, after all, a major alteration to the way information is being presented to the brain for processing, and some people, not all, find there is initially at least, a tendency to suppress the extraordinary interpretation of space it reveals. Because of this unfamiliarity, the full pseudoscopic experience might take a little time to assert itself. Some people find that they can never see a pseudoscopic image. These pseudoscopes come as a kit form, and require assembly. The main body of the pseudoscope is made of pieces of laser-cut acrylic. The 4 mirrors are already cut to size, and come complete with double sided sticky pads, so no glue is needed. There is a tripod/screw adaptor. Also in the box is a expanding sphere and a memory foil wand, which together act as a 'pseudoscopic target'. Plus a set of instructions. The acrylic parts need to be assembled carefully to avoid snapping them, and we would therefore not reccommend the kit for people under 16 years.